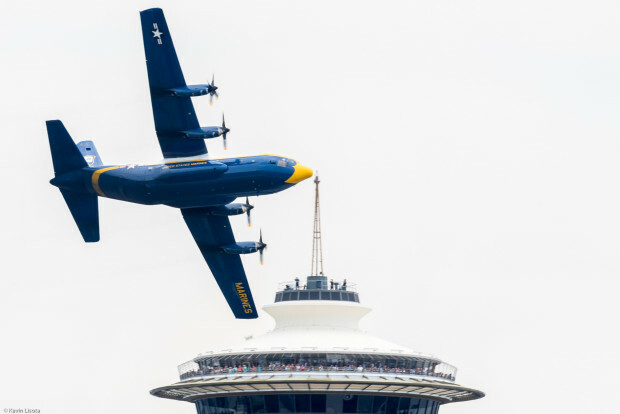 Hey, hey, hey … it’s Fat Albert, in the skies over Seattle: We’re not talking about the jumbo-sized character created by comedian Bill Cosby back in the day, but the C-130T transport plane that’s back in its place among the Navy’s Blue Angels for Seafair Weekend’s Boeing Air Show. Fat Albert may not be as sleek as the six F/A-18 Hornets that will be executing fancy aerobatic moves over Lake Washington this weekend. But as far as Marine Maj. Mark Montgomery is concerned, that just means there’s more to love. This entry was posted in GeekWire and tagged Aerospace, Aviation, Blue Angels, Military, Seafair, Technology. Bookmark the permalink.